Designed on a durable main frame that measures 18-1/2"W x 56-1/4"H x 1-1/8"D and easily hangs over any 2 x 4 or may be permanently mounted. 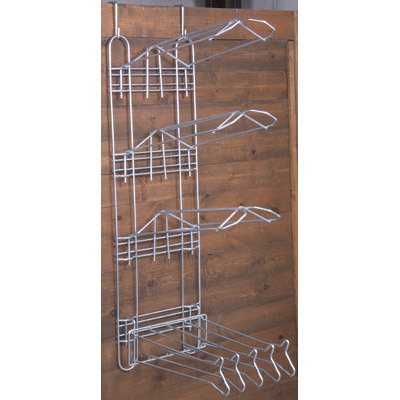 This cleverly designed unit keeps saddles and supplies hanging upright & off the ground and is very portable. The main frame is lightweight, yet extremely durable. 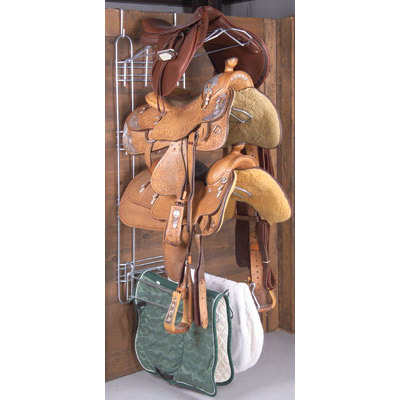 All saddle racks were created to hold Western and/or English saddles. Carefully developed with the needs of a variety of riders in mind. Remember, since this was designed by horsepeople who travel near and wide, unit can be easily unassembled for traveling and for use at shows. Easy, functional, durable and cleverly designed! Includes durable hanging hooks. Includes three durable saddle racks and a uniquely designed saddle pad holder that holds up to five saddle pads. The five bar design (with horse head ends) makes it easy to conveniently air out saddle pads in minimal time. Each saddle rack measures 14-1/8"W x 8-3/4"H x 25"D; saddle pad holder measures 17-1/4"W x 6-1/4"H x 24-1/8"D. Will be drop-shipped directly from the manufacturer to you. Please allow up to 10 days for delivery of drop-shipped items. Shipping weight is 70 lbs due to size of item.